knottief18053378e6582aa, jmlehman-2, kaffyc99, skeltjo, Knottie1444437202 and luttrell3 earned the First Anniversary badge. knottie940a51cac7589299, caichan, knottie7d6cf6ddc8858bef, julesDW2009, knottie34af756483c1a97f and 18 others earned the Photogenic badge. knottiee82ab67190ce037e, steffy7, knottiec67aa6b400ce90c1, latifa06, knottie8e16cf954799e1eb and 149 others joined. Kurtni, begging4abump, nnaelilak, kimmer1412, mccurleya and 7 others earned the 500 Love Its badge. What are we eating ladies?? I want anything and everything salty: potato chips, goldfish crackers, movie theater popcorn. YUM. Give me all the salt! My appetite has decreased which is new. I'm just waiting for my appetite to ramp up and like my first pregnancy. TWINS due October 19th, 2019. I'm opposite, @galentine I want anything sweet. Cookies, brownies, fruit, jam, muffins, give them to me now! And this is so weird because I never crave desserts! I also woke up ravenous last night around 2:30 and scarfed down a pita with hummus and chugged two glasses of water. I swear to God I'm going to gain 500 pounds in the first trimester alone. @elle-0409, I'm a little worried about over-doing it in the first trimester too, but eating helps keep the nausea away! I'm pretty much constantly snacking. And since I'm snacking on salty stuff, I'm already bloating up like a Macy's parade balloon. BFP #5 1/18/19, EDD 10/3/19, It’s a Girl! @galentine LOL! I force fed myself egg whites for breakfast because I need some kind of protein in my diet of pastries. I agree that eating keeps the nausea away. My friend who is in her second trimester told me not to feel bad about what I'm eating. Her doctor told her the goal is just to keep things down in the first trimester, whatever that is. If it works, eat it. I am going to have to make buffalo chicken with ranch become a reality at some point today. For the past week or two I have been making “protein boxes” (turkey, cottage cheese, walnuts and cucumbers) for breakfast since eating enough protein was a struggle last time, but that’s no fun. I literally have different cravings each day, never for anything healthy of course!! Trying to eat healthier this pregnancy but I feel like I'm failing miserably. I’ve been eating eggs and sour dough toast. Like every meal. @ceclarlinetlo YAY for the buffalo chicken sandwich with ranch!! I'm also cracking up that you appear to be eating your lunch in the car, which I've been known to do myself a time or two! I was eating in my car 😂. I didn’t want to wait until I got home but also didn’t want to deal with getting DS in and out of his seat lol. All I've wanted for the past week or so is an Italian sub, but alas, lunch meat is off limits. That and french fries from Five Guys. @cuduebor I loooovvvveee the Cajun fries from Five Guys. I wish it wasn’t a salt bomb though. Did somebody say salt bomb?? Maybe I need to try these then, LOL. @ceclarlinetlo, after your photo earlier, the temptation was too strong... 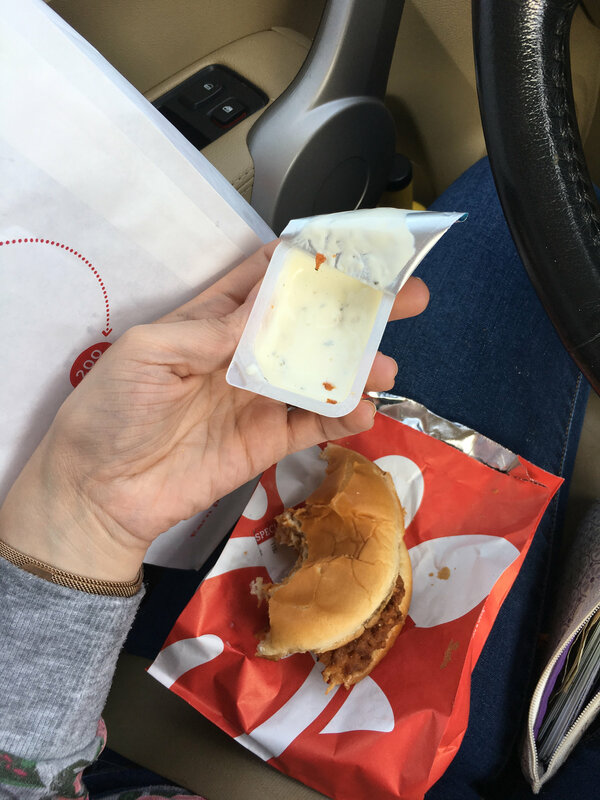 I had to have Chik-fil-A for lunch too 😂 It really was perfect though, hit the salty-spot and curbed my nausea all afternoon (so far anyway.... knock on wood!) So thanks for the suggestion! I haven’t had any cravings per se but I think I’ve reached the point of almost everything makes me nauseous when I think about it and if I manage to think of something that sounds appetizing, it’s that or nothing. @melanier26 Exactly! All that sounded good to me was macaroni and cheese. When I got to the grocery store and stood in an aisle filled with Mac ‘n cheese, I literally cried a little. I was so happy! @nachellebeck13 I have decreased appetite this go round too and not from the nausea. So weird cuz with my least pregnancy, if anything got near my face I ate it. I also had an aversion to salad stuffs, it was rough. Needless to say I gained way too much and am hoping the lighter, healthier-eating pregnant me is going to stick around. That being said, I might have spent half hour of my ride home from the doctor today trying to decide between Taco Bell or Wendy's. Wendy's won with spicy chicken and those darn baconator fries. I think this little nugget is all about the spicy. Third BFP: 2/7/17 (13 dpo) = EDD 10/20/17 *** BORN 10/23 *** We got our Rainbow! hell yeah that wendy’s spicy chicken sandwich is king. oddly enough the only pregnancy symptom i’ve experienced thus far are rampant cravings for vegetables. i’ve been going out of my way to eat vegan and veggie bowls whenever possible (lots of beets, brussels sprouts, and avocados!) so idk maybe my body’s telling me i need something green or i’ll die of scurvy. I don't think my appetite has changed yet. I'm not feeling super hungry. Trying to eat healthy. I gained 50 lbs last time and ended up with high BP at the end, so definitely going to be more cautious with what I'm eating this time. Also, I have way worse heartburn in the past year or two, so sadly hoping that will help me keep eating small meals and less unhealthy foods that make the heartburn worse! Last time I had a food aversion to chicken. Really hoping that doesn't happen this time. I'm trying to pack in all the things I know I won't be able to eat anymore before morning sickness truly hits, especially protein and veggies. I would say it is still pretty early for me to have many cravings or aversions. Last time they were pretty mild though so it took me a little while to realize that’s what they were. I craved French fries and watermelon (it should probably be noted here that I put salt on my watermelon), which does sound pretty darn good at the moment. I had an aversion to beef which I don’t go out of my way to eat anyway, so that worked out. I was nauseous all morning and kept changing my mind about where we were going for our Valentine’s lunch. I ended up choosing Chick Fil A when we got in the car and I’m feeling better now! @melanier26 That does sound delicious! Nothing like a little Chick-Fil-A to make your day better. Today has started off *bleh*. I wouldn't say I'm totally nauseous but just not into what I packed myself for the day. It's raining here in SoCal but the only thing that sounded remotely appetizing was a six-cheese bagel, toasted with butter and garlic&herb cream cheese. So I walked down the street to get it because otherwise I know I would have been wondering all day if it would have made me feel better (it did!!). Uh, I think we had the same pregnancy. Nothing was safe from me when I was pregnant with my first. Towards the end though I was basically surviving on Taco Bell, frozen pizzas, and Lays potato chips. Now? I'm like..."it's been 5 hours...maybe I should eat?" I've lost weight, which has alarmed my husband, but I weighed myself this morning and I was back up 4lbs. Today for lunch I had an apple, string cheese and skinny pop. The thought of anything hot made me 🤢 But I was fine eating a hot dinner tonight. Weird. @cooaladolly Do tell about these baconator fries. Is it just fries with bacon on it? We got married in November with only a photographer in attendance. No witnesses, just the city council lady (we just wanted the date to be our 10 year anniversary). So the party will be in July in our yard. I was browsing buzzfeed for inspiration and oh man. I want it ALL. Eggs! Give me all the eggs. Especially fried or scrambled. And salad, I am eating a giant salad for lunch and dinner most days. For some reason sweets are not appealing to me right now, and I normally have a huge sweet tooth. Lathered in bacon and cheese!